The Freedom Snack Bowl with Suction Pad Base is a large, high sided bowl that is ideal for individuals who cannot eat or drink without some assistance. The heavy duty unbreakable bowl is attached to a removable suction-pad base that will not move on clean, flat surfaces - no matter how hard it is bumped or hit.The Freedom Snack Bowl with Suction Pad Base has an outside diameter of 8 inches. The diameter inside of the bowl is 6 inches with a 2 inch depth inside. 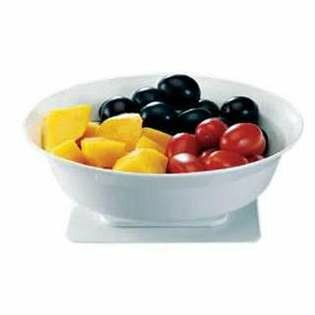 The Snack Bowl and the Suction Pad Base together weigh 13 oz. The FDA-approved bowl is dishwasher (top rack) and microwave safe.The patented suction pad base is easy to attach. Simply turn the Freedom Dinnerware Snack Bowl over to attach the pad to the bottom of the bowl. It is like putting a lid on a jar. Hand tighten until the base is secured.Freedom Snack Bowl with Suction Pad Base Features:Suction pad base holds the Freedom Snack Bowl in place.Perfect for flat table tops, wheelchair trays and over-bed tables.No more non-slip pads or suction cup feet that slide and loose their grip.Freedom Snack Bowl with Suction Pad Base Specifcations:Material: Polypropylene, no phthalates or bpa.Bowl measures: 8 inch diameter overall, inside diameter 6 inches, inside depth 2 inches.Color: White.Includes: Freedom Snack Bowl and Suction Pad Base. If you have any questions about this product by Freedom, contact us by completing and submitting the form below. If you are looking for a specif part number, please include it with your message.